Published on Monday, November 13, 2017. This article appears in the October/November 2017 issue of American Craft Magazine. The Olio’s commitment to repurposing includes its own recycling business, reflected in the shop’s wares. 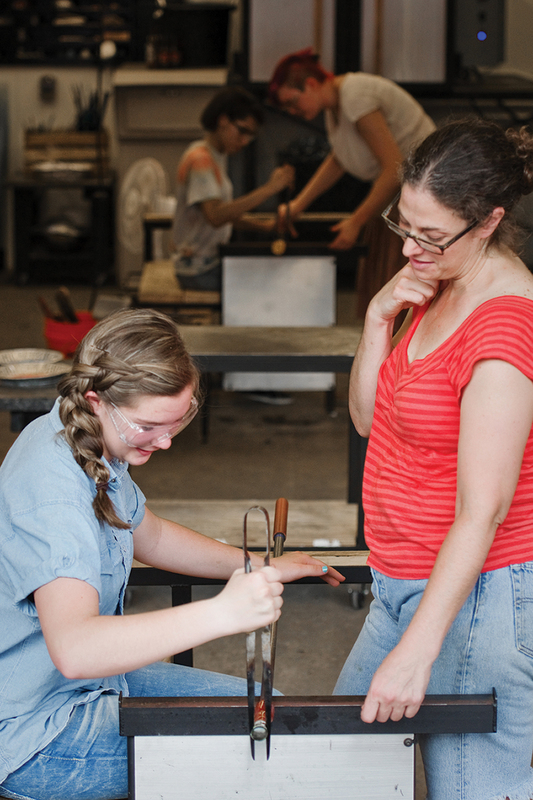 As a sophomore at the University of Illinois, Rebeccah Byer was “kind of floundering in school and not really finding my fit.” She had taken a few art classes and wanted to take pottery that year, but when it was full, she opted for a glassblowing course. “Everything” includes hosting field trips for students, company team-building exercises, and private workshops; Byer enjoys providing what she calls the “bucket-list experience” of working with glass. The program also includes contributing to an eye-catching line of products. The Olio sells a wide range of glassware such as tumblers, candleholders, and Band’s macabre sculpture – one piece depicts a lab rat growing a human ear out of its side – and the apprentices learn on the job. In fact, Byer says, “there are [products] we design and develop specifically to help the apprentices learn,” starting with the basics. One vase, for example, takes its shape from pulling, a more manageable technique for a beginner than trimming. Then apprentices can move on to more advanced work, helping to make bathroom sets or even sculptural work. Besides helping people develop professional skills and, potentially, a trade, the Olio has an environmental mission. Much of the work the company produces is made of repurposed glass, which promotes sustainability and imparts a practical lesson. “I think it’s really necessary to teach artists how to be more creative if they can’t afford materials,” Byer says. They just have to take the first step on the path – which, as Byer knows, can make all the difference. Sculptor Sarah Band is the Olio’s creative director. 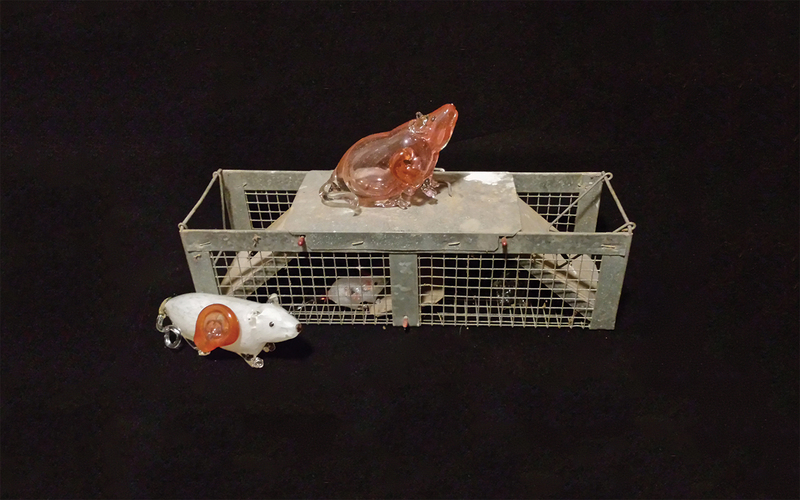 Band’s work often tilts toward the eerie, as in her assorted Lab Rats.